In addition to its schedule of programs in Portland, the Maine Jewish Film Festival comes to Bates for a screening of the film A Matter of Size at 7 p.m. Wednesday, March 24, in the Olin Arts Center Concert Hall, 75 Russell St. Admission is $8/$6. Facilitated by Associate Professor of French Kirk Read, Assistant Professor of Religion Cynthia Baker, Assistant Professor of African American and American cultural studies Myron Beasley, and Charles A. Dana Professor of Religious Studies John Strong offer commentary after the screening. Directed by Sharon Maymon and Erez Tadmor, A Matter of Size is the absolutely enjoyable tale of Herzl (Itzik Cohen), who always has been overweight. Newly unemployed, living at home with his mother in Ramla, Israel, and banished from his weight-loss program, he finds himself washing dishes in a Japanese restaurant. 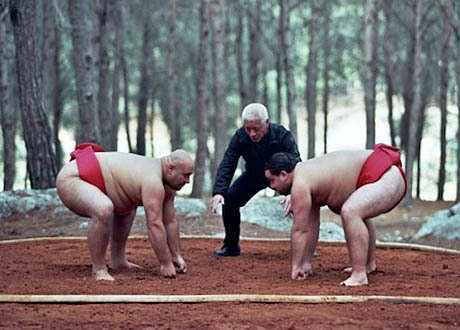 There, he is introduced to sumo wrestling. The sport, in which size is an asset, transforms Herzl. With a few large friends, he pursues his newfound passion, which transforms all of their lives and gives them an entirely new perspective. A Matter of Size is a comedy about a different kind of “coming out” -– that of overweight people who learn to accept themselves and be accepted. Adult themes and sexual content (2009, 90 min.). In another Bates connection to the festival, college staff photographer Phyllis Graber Jensen shows her short film Mustard Doublebreasted in a MJFF screening at 5 p.m. Tuesday, March 23, at the Nickelodeon Cinemas, 1 Temple St., Portland. The short will also screen at Bates, preceding A Matter of Size. 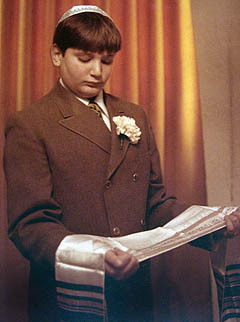 As the 40th anniversary of his bar mitzvah approaches, a son (Norman Graber, Phyllis’ brother) and his parents (Jay and Anita Graber) recall the experience. See a trailer of the film.